Looking at a photograph of the real General MacArthur and Emperor Hirohito I was stunned at how authentic Aleksandr Sokurov’s The Sun looks and feels. Perhaps because world politics today are ugly and cruel and shaped by misnomers and backstabbing, it is shocking to think that enemies can come to an understanding to save the lives of millions in the midst of a violent war. 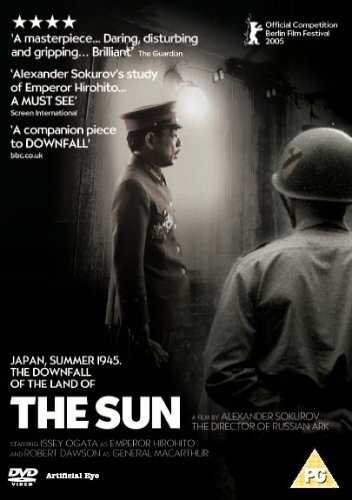 The Sun is neither an anti-war film nor propaganda. It is an artistic document of one of the most forgotten and powerful events of the 20th century. Issei Ogata is masterful as Japan’s 124th emperor. The film begins much like Sokurov’s first entry in his tetrology on the world’s powerful dictators, Moloch, an indictment on the comical stupidity of Adolf Hitler. Hirohito, like Hitler, wanders around his dark castle (upon further reading I understand it now to be a laboratory, the only stone building left standing on the Emperor’s property) while outside a war threatens the security of the state. A thick fog clouds everything, an obvious metaphor for the cloudiness of an angry mind. Moloch was a terrible film, a (dare I say it) propaganda film against Hitler that mitigated the seriousness of the Nazis, portraying all concerned as vapid jokesters without a lick of military sense. As much as he should be despised, Hitler was a brilliant man. This languorous beginning to The Sun is very boring I must admit. Nothing much happens in the first 40 minutes, or so it seemed while watching. Hirohito is dressed by his many servants who actually believe him a celestial being. His food is served and all but chewed for him. He appears as a retarded child, his mouth quivering from nervousness or lack of imagination. His steps are small and he is a very formal, preoccupied man. His interests are marine biology and poetry. At times he appears like the great tramp, Charlie Chaplin. This thought occurred to me as Hirohito looks through a photo album of Hollywood stars. He comes to and admires the beautiful face of Chaplin, though we learn he does not know who the actor is. He looks at this photo album just after looking at an equally distant album of personal family photographs. Neither reality is close to him. Revered as a god, Hirohito cannot speak to anybody but his chamberlain. He has been prevented from doing things that make one an individual. He is a mal-adjusted child. What surprised me was the human journey that Sokurov carves of his character. The film begins after the atomic bombings. Hirohito had already made his voice heard for the first time on Japanese radio. The film, in nearly every description you might read, is about this deity coming to terms with his ordinariness. For someone who was once a god, this might seem like a sad tale. That’s what I thought going in, but Sokurov treats this as a story of a man who for the first time discovers his humility; someone who comes to worship his common status, who appreciates conversations and attention from lesser beings. Hirohito is slowly giving up his powers, and part of his settlements with General MacArthur requires him to be photographed for the western world. The American and British press is briefed beforehand, instructed on the correct pronunciation of his name, the distance they must remain away, and the time allotted to snap pics. Hirohito wanders outside his palace dressed more like a hobo than an affluent man. He dons a bowler and wears a jacket and pants that are maybe a little too big. He reminded me most of Chaplin’s tramp in this moment. He wanders around while his photo is taken, happy as a lark, posing humorously with his nose to a flower. For the first time we see this defeated man happy. The photographers call him “Charlie” and the palace guards are angry at the disrespect. Hirohito grabs the rim of his hat, like Chaplin often did, and scampers back into his palace. The great scenes in the picture are the dialogues between Hirohito and MacArthur. Robert Dawson is terrific and bears a striking resemblance to the American general. MacArthur is a bit smug during their first meeting. As someone also of power whose reach is in check by law, he finds it both absurd and amusing that the emperor cannot even open a door for himself. He is still upset about the attack on Pearl Harbor. What impressed me most is that the film, from their first meeting on, put me in sympathy with the Japanese emperor. When at first he always spoke through an emissary, he addresses General MacArthur in English. He admits he can speak several languages and is proud to be Japanese, disappointed at his country’s loss, but not furious at the enemy. MacArthur, we soon learn, is doing something desperate to end the war and spare Hirohito’s life. The man defied centuries of tradition to speak to his people via radio in order to prevent further killing. Perhaps MacArthur was in need of an adversary who did not hate humanity. Hitler kept the war going for days after his suicide and Mussolini was taken down several times by his own countrymen. Here was a leader in the Axis powers who showed compassion, and after such a dispassionate war I believe MacArthur needed something positive to happen. I may be romanticizing too much, but let it be known that Hirohito was emperor of Japan until his death in 1989 and was never tried as a war criminal. This is a great story and one that I was so impressed to see portrayed level handedly. The initial smugness of MacArthur led me to believe Sokurov, like many European filmmakers, would treat the Americans as impatient and vicious dogs. Especially where Sokurov was born after WWII and raised during the Cold War, I imagined he would have a negative attitude towards the US. MacArthur is a decent man in this film. His relationship with Hirohito livens the material, makes it a near masterpiece. I would very much like to see it a second time. I wonder if the beginning will still feel too long. The film might improve on further viewings because, by the end, we know the whole story and can observe different facets of what we are first shown. Aleksandr Sokurov is a curious filmmaker. Mentored by the master Andrei Tarkovsky, Sokurov’s movies are always heavy and loaded with big ideas. He seldom has made a successful film. I know European film lovers have reverence for him. His films always show in competition at Cannes, but other than The Sun I’ve only found one other masterpiece: Father and Son. I have not seen Taurus, Sokurov’s second in his collection of dictator films. After the disappointment of Moloch, I was not interested, but I am now. The Sun surprised me because the longer I watched it the more I understood. Perhaps when they are all finished, the series will say something important. The Sun, for lack of a better word, is sensitive towards its subjects and surprisingly optimistic towards politics. Perhaps Sokurov has an answer waiting at the end of his art.